Go to original pattern for design DROPS 73-10. 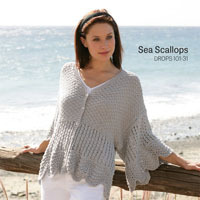 DROPS Pullover in Vivaldi or Brushed Alpaca Silk with Glitter. 200-200-200-250-250 gr nr 06, off white. 200-200-200-250-250 gr nr 01, off white. DROPS 5.5 mm [US 9] and 6 mm [US 10] needles, or sizes needed to obtain correct gauge. Short circular needles 5.5 mm [US 9] (for the neck), or size needed to obtain correct gauge. 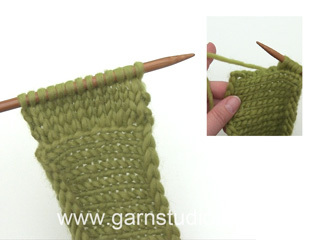 Gauge: 15 sts x 32 rows = 10 x 10 cm on larger needles in garter st. 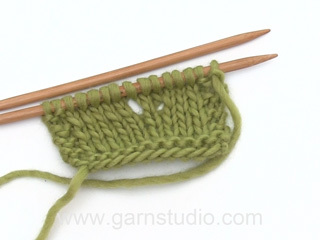 Cast on 65-71-77-83-89 sts on smaller needles with Vivaldi or Brushed Alpaca Silk. 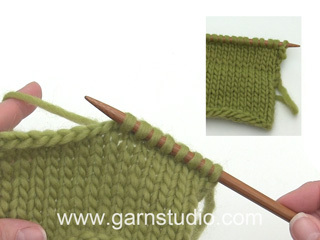 Knit 8 rows garter st, change to larger needles and stockinette st. When the piece measures 8 cm knit garter st to finished measurements. At the same time when the piece measures 12 cm inc 1 st at each side every 9 cm a total of 3 times = 71-77-83-89-95 sts. When the piece measures 36-37-38-39-40 cm bind off for armhole at each side every other row: 4 sts 1 time, 2 sts 1-2-3-4-5 times and 1 st 2 times = 55-57-59-61-63 sts remain. When the piece measures 46-47-48-50-51 cm bind off the center 11-13-13-13-15 sts for the neck. Then bind off at each neck edge every other row: 2 sts 1 time and 1 st 5 times = 15-15-16-17-17 sts remain on each shoulder. Bind off when the piece measures 56-58-60-62-64 cm. 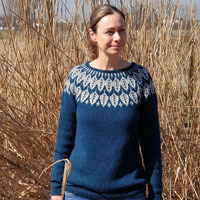 Back: Cast on and knit the same as the front. 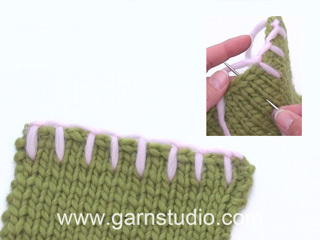 Bind off for armhole as on front and continue until the piece measures 54-56-58-60-62 cm. Now bind off the center 23-25-25-25-27 sts for the neck. Then bind off 1 st at each neck edge on the next row = 15-15-16-17-17 sts remain on each shoulder. Bind off when the piece measures 56-58-60-62-64 cm. Sleeve: Cast on 35-37-38-40-41 sts on smaller needles with Vivaldi or Brushed Alpaca Silk and knit 8 rows garter st. Change to larger needles and stockinette st. Inc 1 st at each side every 3-3-2,5-2-2 cm a total of 11-11-12-13-14 times = 57-59-62-66-69 sts and at the same time when the piece measures 15 cm knit garter st to finished measurements. When sleeve measures 48-47-45-44-43 cm bind off for sleeve cap at each side every other row: 3 sts 1 time, 2 sts 1 time then dec 1 st at each side until the piece measures 56 cm and then bind off 2 sts at each side until the piece measures 57 cm. Bind off the remaining sts. Neckband: Pick up approx. 66-80 sts around the neck with smaller short circular needles and Vivaldi or Brushed Alpaca Silk. Knit 8 rows stockinette st, bind off - the edge will roll. Outline stitch: sew with 1 strand Vivaldi or Brushed Alpaca Silk + 8 strands Glitter. Sew in the transition between stockinette st and garter st on the body and the sleeve as follows: Stick needle in the third row of stockinette st counted down from transition, * count 2 sts to the right and 2 rows stockinette st + 6 rows garter st up, stick the needle here, count 2 sts to the right and 6 rows garter st + 2 rows stockinette st down and stick needle in 3 rows stockinette st counted down from transition *, repeat from * - * around Body and sleeve. Sew the same around the neck but put needle in 4 rows garter st below neckband, count 2 sts to the right and up 1 row in the stockinette st of neckband. Buongiorno Erica. In questo modello i ferri circolari vengono suggeriti per riprendere le m intorno allo scollo. Un cavo lungo 60 cm può essere la lunghezza corretta. Se si trova meglio, può usare i ferri a doppia a punta al posto dei circolari. Buon lavoro! Dans l'explication du devant, pour les diminutions pour les emmanchures, cela ne me semble pas clair du tout : voilà ce qui est écrit dans l'explication : .... emmanchures de chaque côté tous les 2 rangs : 1 fois ' m, 1-2-3-4-5 fois 2 m et 2 fois 1 m = 55-57-59-61-63 m. Voilà , je ne comprends pas du tout, après les : 1 fois ' m, etc... ne manque-t-il pas un chiffre à la place de ' après le mot fois ??? Merci de m'éclaircir. P.B. Bonjour Mme Bourdeaud'huy, c'était une faute de frappe, il fallait lire: "1 fois 4 m", le texte a été corrigé, merci. Bon tricot! Sleeve instructions: What does this mean??? Inc 1 st at each side every 3-3-2, 5-2-2 cm 11 times??? Dear Mrs Kerscher, you will have to inc 1 st each side (ie at the beg + at the end of the row) every 3 cm (size S and M), 2,5 cm (size L) etc... a total of 11 times. You will then have inc 22 sts (size S and M). Happy knitting! 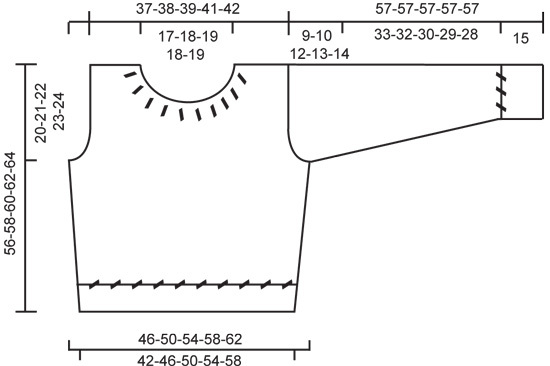 I'm reading the pattern right now for the sleeve and am unsure about the wording. It says: "Inc 1 st at each side every 3-3-2,5-2-2 cm". Should this be "Inc 1 st at each side every 3-3-2-2-2 cm" instead (omitting the 5)? 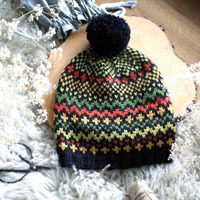 Dear Mrs MacCoy, it really means 2,5 cm, so every 2.5 cm in size L. Happy Knitting!